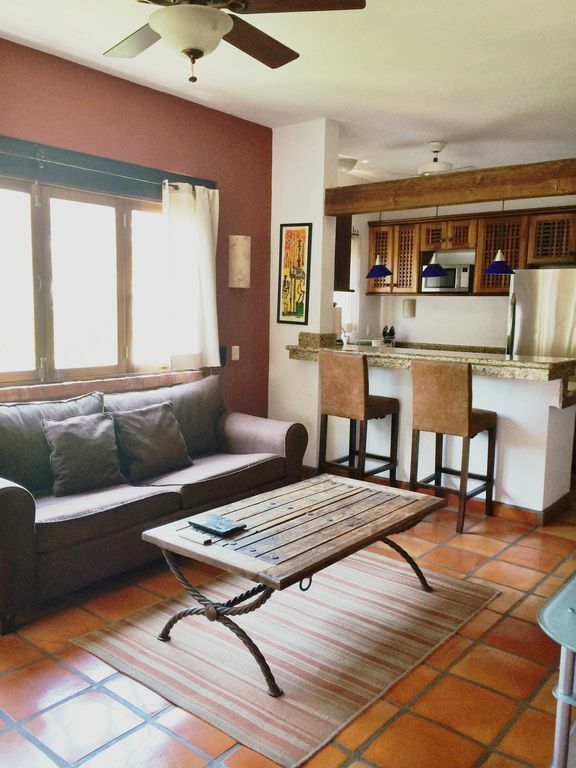 This one bedroom, two bathroom condo is located in one of Puerto Vallarta's beautiful hidden gems: Selva Romantica. Selva is a gated community, professionally landscaped with around the clock security two blocks from Los Muertos Beach, the most popular in Puerto Vallarta. The development was designed in traditional Mexican style giving each condo, unique old world elegance. The entrance is on the ground level of the complex but is elevated from the street for privacy and peaceful ambience. All counter tops are granite, both showers are marble, and several custom stained glass windows adorn the condo throughout. There is fiber-optic internet, a washer/dryer in the unit and large private balcony. There is an infinity pool you can lounge around for hours, a comprehensive exercise facility to keep you fit and a large palapa with wifi where you can sit for hours out of the sun and catch up on email or read your favorite novel. Within short walking-distance from Selva is Los Muertos beach where tourists and locals, alike, enjoy paragliding, surfing, swimming, fishing and inner tubing. The Malecon is also a short walk away, stretching over a mile and filled with locals, tourists, and specialty shops. There are many places that you can drive or cab to as well, including a movie theater, zoo, circus, and several horseback riding destinations. The Romantic Zone of Puerto Vallarta also offers amazing cuisine for anyone’s taste, from street markets to five star dining. All of the restaurants in and around the Romantic Zone are worth a try, many of which are the best in all of PV. Visit Trip Advisor or any other food-rating system to see what other visitors and locals like best! The owner and development are not tolerant of the 'party crowd' so if your plans include copious amounts of alcohol and loud noise you would be best advised to look elsewhere. If you are looking for a quiet vacation in one of the most unique developments in Puerto Vallarta this is the unit for you! Please note: There is absolutely no smoking in the unit OR on the private patio. I am a Northern California native who fell in love with the authentic charm and beauty of Puerto Vallarta while traveling with my uncle. Currently, I am the owner of two condos at Selva Romantica: Paraiso #6 and Paraiso #1 (Both can be found on VRBO). Recently, I received my BFA in Graphic Design from the Rhode Island School of Design (RISD) and am settling back in the San Francisco Bay Area for work. These properties were left to me by my late uncle, Fred Hansen, when I was 16 years old. Many asked why I chose to rent them rather than sell given my age, but selling was never an option. Selva Romantica is one of the most unique places in the world to me and holds some of my happiest memories. Over the past 7 years, I've worked very hard to upkeep and embellish upon the units that were left to me, all with the goal of sharing the beauty of Selva Romantica with others! This property is perfect for those who want access to all the wonders and charm of Old Town Vallarta but who want to stay out of the way of the overall hustle and bustle of the touristy, beach hotels. While it seems like new developments go up every day in Puerto Vallarta, there are none that capture the authentic, old world design and latin charm as Selva Romantica. Anything else seems basic and cookie-cutter in comparison. toilet, shower, Smaller, full bathroom located by the laundry room. Bath and kitchen towels are provided. Can’t wait to stay here again. Perfect location! Lovely host! Perfect place to stay!! This is a very comfortable, well-equipped condo in an excellent location. The Selva Romantica condominium complex is the best spot in Old Town: right in the center of all the activity, but quietly removed from it, lush and private. With all the new construction in the area you no longer feel "above it all", but the small scale of the buildings, expansive pool area, and beautiful gardens still make it my go-to place. This unit, like the complex, is refreshingly different from the Euro-Modern-Ikea buildings going up in the area: it's warm and traditional without feeling dated. The bed is very comfortable and the view of the mountains is nice, and Mavy, the rental agent, was easy to work with. The "Pelicanos" embroidered beach towels were a nice touch, and, while not fancy, the kitchen has all the equipment you need for simple cooking, and the host's recommendation of the homemade greek yoghurt at the market cremaria should be heeded! Mountain views were nice especially at night. Many tall buildings under construction blocks the ocean views. This property is a gem. Photos do NOT do it justice. The tiles, furniture, and style are tasteful, local, and don't crowd the space. It was very comfortable for the two of us. The living room with fold-away windows turned it into a lovely outdoor space for us to relax one evening with two friends over a little wine. The bathrooms are nice (having two was a plus!) and that master shower was GIGANTIC! The property is wonderfully located and has many great amenities. The hills in PV can be exhausting but this property only has one slight hill and then you are in the action! It was quit at night but close to the restaurants, bars, and beach! We'd def stay here again. A repeat should we return to PV. This is our 5th trip to PV but our first at Selva Romatica. We discovered this lovely complex during out daily walk and fell in love with it's location (Up the hill but just a two block walk to the main street). The condo is simply perfect. Every morning we would open the patio doors and gaze out upon the waking city. There is a balcony off the bedroom, but frankly the dining room with wall to wall doors that open up is even better (helps you stay out of the sun). You're just steps from the pool (but not so close that you're disturbed by it). It's also a relatively quite complex given it's proximity to the city (though music from other units can bounce off the walls). The amenities were perfect and the condo was just as we expected. Our only complaint would be that there isn't water service (which we've had at our other places), so you have to lug water up from the local stores. Be wary, too, if you have any health issues, the walk up the street is steep and a bit challenging. Over all, though, a simply wonderful place!